Rubber Processing Chemicals Market size was more than USD 3.5 billion in 2017 and will witness 4.9% CAGR during the forecast timespan. 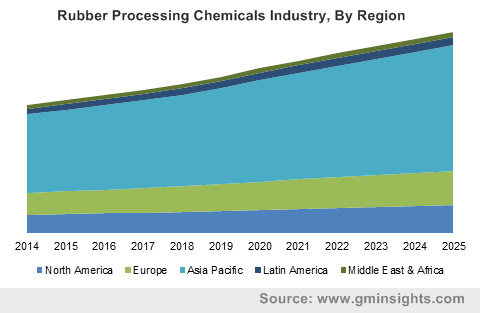 Global rubber processing chemicals market will be primarily driven by the growing automotive sales across the globe in the coming years. Tire manufacturing is the biggest application segment of the industry. It holds over 70% share as compared to non-tire components. In 2016, the global tire market volume crossed 3.4 billion units and is expected to reach 3.66 billion units by 2020. This exponential increase in tire demand will be primarily driving product demand over the forecast period. The growing use of rubber in floor coverings, sound insulation, roofing materials and sealants in construction industry will fuel product demand over the next few years. Rubber processing chemicals are also used for conveyor belts, footwear & ball bladders, gaskets, seals, O-rings, gum, hoses and lining & coatings. These applications come under the non-tire segment of rubber. Rapid industrialization in Asia Pacific, particularly in China and India, will be prominently driving demand for these industrial components (conveyor belts, hoses, gaskets, adhesives, asphalt, etc.) 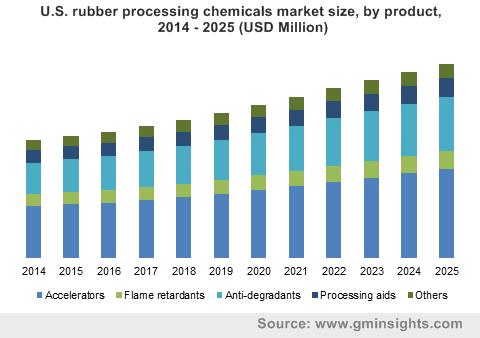 in the coming years, which will subsequently augment rubber demand, leading to rubber processing chemicals market size growth during the forecast timeframe. Stringent regulations regarding use of rubber processing chemicals is likely to hamper product demand over the next few years. The processing chemicals used for rubber are hazardous for environment and aquatic life as most of them are discharged in water bodies. EPA and European Commission have put down strict rules for use and disposal of these chemicals. It may obstruct the market growth over the forecast duration. Accelerators held the largest share in global rubber processing chemicals market in 2017, both in terms of volume and value. Accelerators is a class of chemicals which is used to speed up the vulcanization process. There are two types of accelerators; primary and secondary. Primary accelerators include thiazoles and sulphenamides. Secondary accelerators include thiurams and dithiocarbamates. Use of accelerators in rubber processing enables manufacturers to manipulate curing temperature, sulphur dosage, etc. Another important product segment of rubber processing chemical market is anti-degradants. These are basically used to deter the aging in rubber products. It primarily includes antioxidants and antiozonants. Antioxidants are used to protect rubber from deterring effect of oxygen during its shell life whereas antiozonants are chemicals/waxes that ‘bleed’ to the surface of rubber articles, protecting it from ozone attack. This segment will witness significant gains in global market over the forecast timespan. 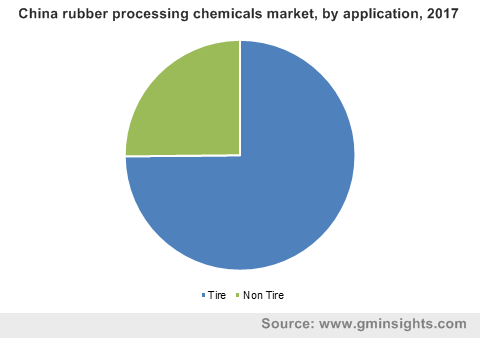 The most important application segment of global rubber processing chemicals market in 2017 was tires. Tires hold more than three quarters of the total rubber processing chemicals sales across the globe. The segment will witness maximum gains during the forecast period. According to OICA, passenger cars sales in 2017 was approximately 70 million units across the major continents. It witnessed a substantial rise from 45 million units in 2005. The number are poised to witness exponential rise which will ultimately fuel rubber processing chemicals demand in the coming years. Non-tire applications segment will also expand at substantial CAGR during the forecast timeframe. The growing number of production plants in Latin America and Asia Pacific will be fueling rubber demand and hence product demand over the forecast timespan. Asia Pacific accounted for the largest share in global rubber processing chemicals market in 2017. The region shall witness substantial gains in terms of volume and value in the coming years primarily owing to the rising passenger and light vehicles sales across China and India. These two nations are leading automotive sales in Asia Pacific due to rising per capita income which has propelled high spending power among consumers, leading to growing demand for budget as well as luxury vehicles. Europe and North America were prominent regions in global rubber processing chemicals market in 2017. This can be attributed to the large automotive markets of the U.S., Germany, UK and France in these continents. Non-tire applications are also slated to witness a decent rise in volume numbers in these regions in the coming years. 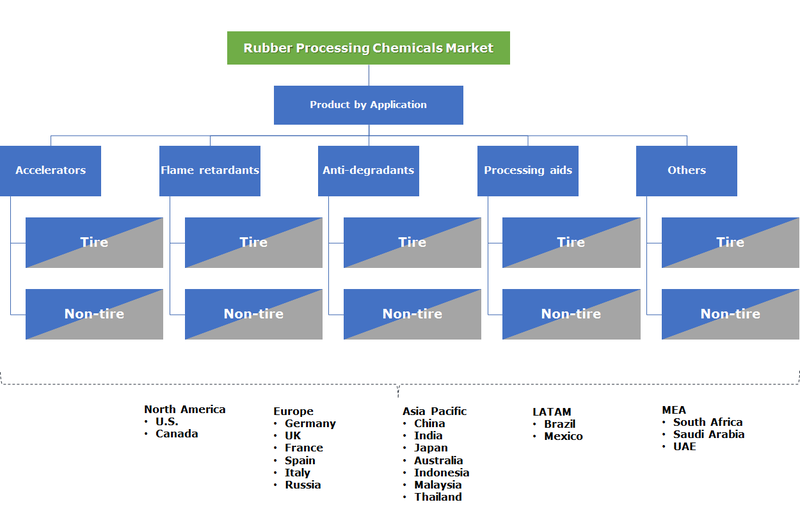 Rubber processing chemicals market has presence of some large multinational players such as BASF SE, Lanxess, Sumitomo Chemicals, Akzo Nobel N.V., Eastman Chemical Company, Arkema and Solvay, Linkwell, Merchem Limited and Emerald Performance Materials Company. These companies have been operating in this space since more than two or three decades, thus have an extended network of distributors and raw material suppliers across the globe. Geographic expansion through investments is one of the key strategic moves of multinational players in the market. For instance, in July 2018, Lanxess announced plans to invest approximately USD 580 million at company’s largest North America site in El Dorado. The move will aid in strengthening company’s growth in its specialty chemicals business in North America. Some industry players also use the strategy of mergers and acquisitions for expanding their existing product line. For example, in April 2015, Arkema acquired Italian company Oxido, which operates in the segment of organic peroxides which are primarily used in synthetic rubber crosslinking. With this acquisition, Arkema plans to increase production capacities and strengthen its position as a top player of organic peroxide in Europe. Rubber processing chemicals includes a large array of substances which are added during rubber processing to enhance the physical properties of rubber. It is done to make it fit for tire as well as non-tire applications. Growing automotive sales, especially growth in passenger cars and two-wheelers demand in developing nations will be largely propelling rubber demand in the coming years, thus positively influencing the market in the near future.